This post was lying in my drafts and wouldn’t have seen the light of day if a reader had not requested for Chilli Cheese Toast recipe. Not much of a recipe really. A quick breakfast/brunch or lunch box recipe that can be prepared in 10 minutes. In a bowl grate a cheese cube (about 2 tbsps). 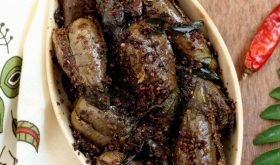 Add 2 finely chopped green chilies, finely chopped small green or red bell pepper, finely chopped small onion, 2 tbsps chopped coriander leaves, pinch of salt and 1/4 tsp pepper pwd to the grated cheese and mix lightly. 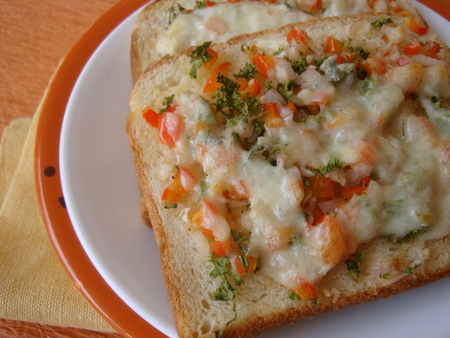 Take a slice of brown bread or whole wheat bread, spread 2 tbsps of the prepared filling and sprinkle some cheese on top. Bake in a pre-heated oven at 175 C till cheese melts and the bread it toasted, approx 5-6 mts. You can use Amul cheese, Mozzarella or Cheddar cheese. chilli cheese toast looks yummy! Thanks so very much for posting such lovely and tasty recipes. Looks yummy and will try this for my daughter ………..
Oh so good, can i have some now???? pls lemme knw how to make d same without using oven? wow, that looks super delicious. Ohhhh such a yummy looking toast 🙂 Would love to try this!!! Thanks for this recipe. It’s wonderful. I used whole wheat bread and sprinkled parmesan cheese. It turned out fine. Did you bake in the oven or toasted it on a tawa? If baking, reduce oven temp to 160 and bake. Thanks for the reply, I used oven, temperature was 180 , will try with 160 next time. Thanks a lot for this recipe. Itâ€™s so nice. my kids loved it and asked me to make again then i tried adding chicken pieces, they were saying it’s like Pizza. once again thank you. Can we prepare this toast on tawa ? Hi Sailu, can this be made on the tava? hi Sailu… this was a real fine recipe.. but i have only a grill oven. how can i make this using a grill oven or a tawa? I tried making this on a tawa, but the cheese doesn’t melt and the bread burns to black… can u please advice? I tried making it on tava, the bread burns black, but cheese doesn’t melt. also tried using a grill oven… no luck… can u please advice? I cant understand some of the ingredients of yours.like black onion ,funkrey seeds,cummin seeds etc. So madam,can you pls find a way to solve this matter,by representing the ingredients with common known familiar names in south India also .Thank you Ji. I tried to GRATE amul cheese cubes in an ordinary grater. cheese becomes powdery. I kept cheese in the freezer. is it the problem?